A panic attack is an exaggeration of the body’s natural response to fear, stress or excitement. A panic attack can occur when a number of overwhelming physical sensations have built-up quickly. Panic attacks will affect everyone differently. Some people may be aware that a panic attack is about to happen, or know what may trigger them. Others may feel as though their attacks come without warning. A panic attack can last anywhere between five and 20 minutes. They often come on very quickly and can be very frightening – for both the person experiencing it and those around them. For children, understanding what panic attacks are can be difficult, making them even more scary to experience. 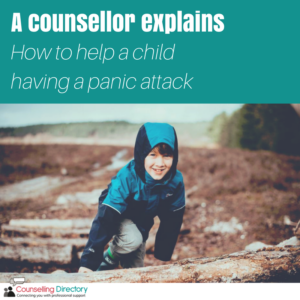 My child is having a panic attack, what do I do? As a parent or caregiver to any child or young person, watching and experiencing them having a panic attack can send a shiver down your spine. What can you do? Here are a few helpful tips on how to respond to a panic attack in a successful way. First, stay calm and watch your body language. Try to look relaxed with a soft tone to your voice. Ask them if they are near, or are experiencing anything that might be triggering the attack. Be confident and reassuring with any actions you may take, such as moving them away from any triggers they may be experiencing. Make sure they are safe and if needed, move them into a safer position, such as sitting down, or even lying down if they feel dizzy or sick. Second, work on a relaxation technique that works for that child personally. Be it slow, deep breathing, cuddling a dog, blowing bubbles to help stabilise breathing, or going to the child’s safe place. Do whatever works for the child, no matter how silly or stupid you think it is. Remember, it is not stupid or silly to the child in a panic. It’s really important that the child feels understood. Third, try to understand what it may feel like to be having a panic attack. The child may appear to be uncontrollable and have irrational terror. Stay with them at all times, until it is clear the panic attack has passed. Do not leave them alone as they may do something without taking into account the dangers involved. Finally, after the dust has settled, remember to take care of yourself as well as your child. Panic attacks are draining on everyone in the family system, so self-care is essential. Death and dying: a taboo subject? Can feeling stuck be positive?